Big thanks to his committee: Dr. Emily Myers, Dr. James Magnuson, Dr. Gerry Altman, and Dr. Rachel Theodore. We are excited to see what Sahil works on next! Please join us in congratulating LAB Lab member Dr. Chris Heffner, who has accepted a tenure-track assistant professor position in the Department of Communicative Disorders and Sciences at the University at Buffalo. Chris will be starting his professor position in August 2020; until then, he will continue as a post-doctoral researcher funded by a fellowship from the Acoustical Society. Congrats, Chris! Check out our debut issue of the LAB Lab Digest! LAB Lab PI Dr. Emily Myers and co-collaborator Jennifer Scapetis-Tycer, of the Dramatic Arts department at UConn, have been awarded one of two 2018-2019 UConn STEAM Innovation grants, worth $40,000. The goal of the STEAM Innovation grant is to encourage collaboration between the arts and STEM fields. A large group of LAB lab members are heading to New Orleans to attend the 2018 Psychonomics Conference, which runs from November 15 – 18. 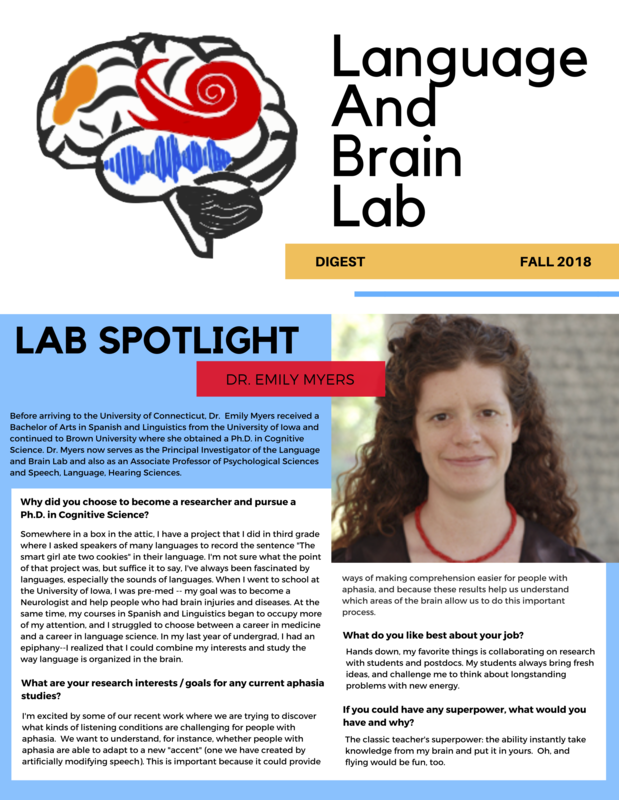 LAB lab PI Dr. Emily Myers will be giving a talk entitled: “Consolidation in Non-Native Phonetic Learning” on November 16th from 10:20 – 10:35 AM in Celestin E (third floor). LAB lab postdoctorate fellow Dr. Chris Heffner is presenting a poster titled: “Reliability and Individual Differences in Phonetic Learning and Adaptation” at Poster Session III on November 16th from 6:00 – 7:30 PM in Elite Hall A (first floor). PhD candidate Pamela Fuhrmeister will be presenting a poster called: “Helping the Rich Get Richer: Aptitude and Challenging Learning Conditions Facilitate Overnight Improvement of Non-Native Phonetic Learning” during Poster Session III on November 16th from 6:00 – 7:30 PM in Elite Hall A (first floor). PhD student Sahil Luthra is presenting two posters. The first is entitled: “Orthographic Neighbor Effects on Visual Word Identification Differ Across Letter Positions” during Poster Session I on November 15th from 6:00 – 7:30 PM in Elite Hall A (first floor). The second poster is called: “Predictive Processing in Computational Models of Spoken Word Recognition” and will be presented at Poster Session III on November 16th from 6:00 – 7:30 PM in Elite Hall A (first floor). Abstracts, as well as additional information about the conference, can be found in the Psychonomics 2018 Abstract Book. Pam Fuhrmeister, PhD candidate, will be giving a talk entitled “Memory consolidation in learning second language speech contrasts” on Friday October 26th from work conducted with collaborators Dr. Emily Myers (University of Connecticut), Dr. Anita Bowles and Dr. David Harper (Rosetta Stone). SLRF 2018 will be held in Montreal, Canada from October 26 – October 28. More information can be found on the SLRF website. New LAB Lab Publication in Language, Cognition, and Neuroscience! 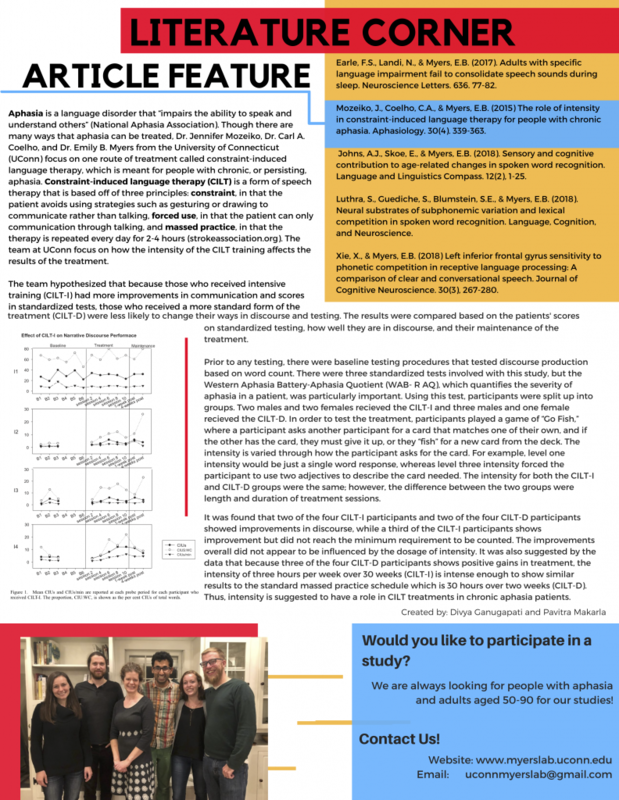 LAB Lab member Sahil Luthra, PI Dr. Emily Myers, and collaborators Dr. Sara Guediche and Dr. Sheila Blumstein (Brown University) have a new publication in Language, Cognition, and Neuroscience entitled “Neural substrates of subphonemic variation and lexical competition in spoken word recognition.” Check it out here. Dr. Emily Myers and Dr. Chris Heffner of the LAB lab, are traveling up to Quebec City to attend the 10th annual Society for the Neurobiology of Language Conference (SNL) from August 16-18. They will present a poster entitled,”Impaired Incidental Phonetic Learning in People with Aphasia” on August 17th. More information about the conference can be found on the SNL website.